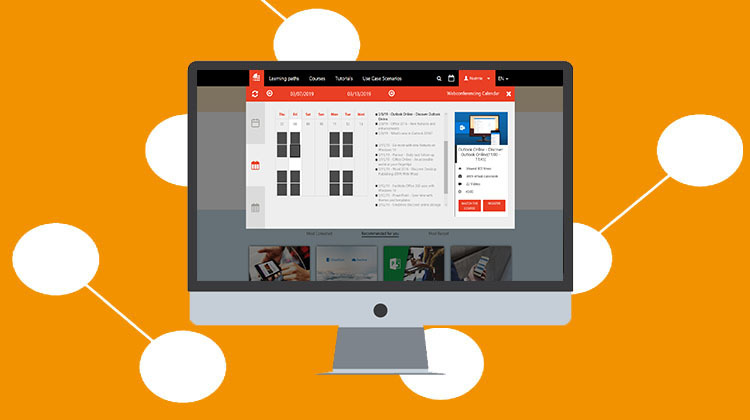 This month, we organized a webinar on the topic “Microsoft Bookings: Online booking process made easy”. We would like to thank everyone who registered! If you were not available for this webinar, the recording is now available on the MOOC Office 365 platform, in the webcast part of the course dedicated to the webinar or on our Youtube channel. A new feature is available, a calendar-shaped logo has arrived at the top of the MOOC Office 365 menu! When you click on the calendar logo, you will have access to all the scheduled live training sessions. By clicking on a session, a preview appears on the right with the course name and the time of the session. Below, you have the number of views of this course, the type of training (such as virtual classroom), the number of related videos (use case scenarios and tutorials) as well as the duration of this session. By hovering your mouse over this preview, you get a short descriptive of this course. Finally, you can either access the course by clicking on the “WATCH THE COURSE” button or register for this session by selecting “REGISTER”. You are not connected to the MOOC Office 365. In this case, just login to register. You can choose between 3 displays: per day, week or month. This view allows you to see all the sessions over a day. You can change the day using the arrows. The double arrows in the top left of the calendar directly refer to the current date in the daily view. This display allows to view all the scheduled live training sessions on a weekday. On the right, you will find all dates and course name. In the same way as before, simply click on a course to find the display on the right of the calendar. The arrows allow you to change the week. The month view provides a global view on the next sessions. The filter helps you to find your session by choosing software, job or subjects.